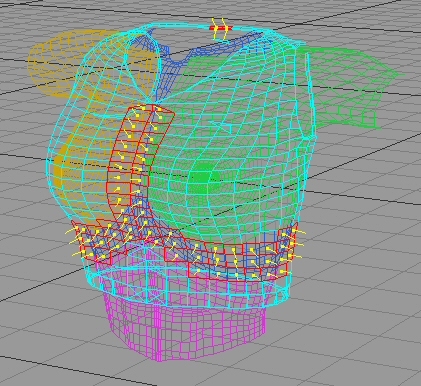 Okay, now that you’ve gotten your clothing item finished in C4D, it’s time to get it in to Poser. But first, there are a few steps that you need to take care of … well you can take care of them in different ways so you have a few choices. P.S. If you haven’t gone through the first part of the tutorial, click here to view it. Export the mesh and do the groups in AutoGrouper. Do the groups in C4d, then finish in UVMapper and Poser. I prefer option 4 so that’s the one I’m gonna ‘splain. Ummm, you did give all the figure body parts different colors earlier, right? 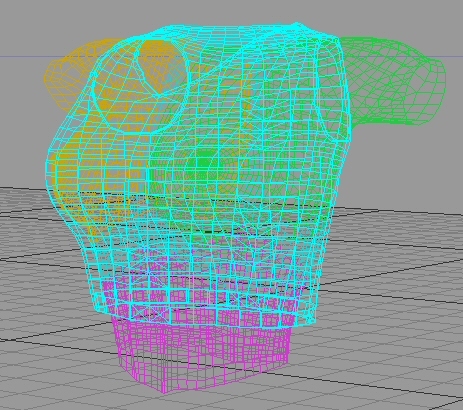 Here you can see my shirt and figure in wireframe with the figure showing through with different colors. I’m going to use those colors to make my selections on the shirt. These selections will be used to split the shirt into body parts. Make sure that your shirt is selected and that you are in Polygon mode. Oh, and it might help to turn on Backface Culling. Choose Selection : Live Selection from the menu. You can use other types of selection, but this is my fave. I usually start with the chest because that makes later selections easier to do. If the item is shorts or slacks, start with the hip. If doing a complete outfit, do the chest first, then the hip, then your choice. Now the person who modeled this shirt didn’t make it easy on me. There really should be a nice poly line going right down the center front and center back of the shirt. Since there isn’t, I’ll have to select the two poly lines on each side of the center instead. 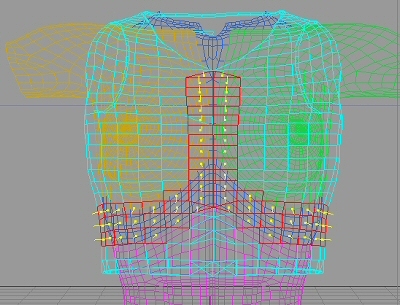 Continue selecting polys following the color of the chest area below on the figure. There will be some overlap, but just make decisions as you come to them as to whether they’ll go with the chest or with the collars or abdomen. When you get around to the opposite side of the bodice, check the other side to see what polys were selected and make sure you select the matching ones on the other side so that they match. This shirt has extra polys at the top so that it looks thicker, so I had to make sure that they were selected by rotating the camera around until I could see them better. I also had to make sure that the polys hanging down from them were also selected. So, make sure you use the camera to rotate around the object to make sure you have everything selected. Okay, here is the chest area all selected. Choose Selection : Set Selection from the menu. 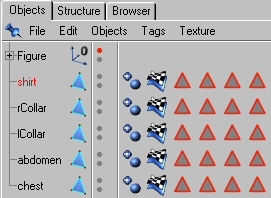 A Polygon Selection tag (triangle) will show up to the right of the object name. Double-click on the triangle and name the selection based on which area was selected, the chest in this case. Don’t click on OK, instead, click on Hide Polygons. Now the chest area is hidden which makes it easier to see what is left for the collars and abdomen. 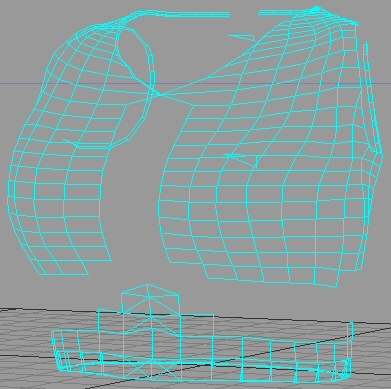 Since this is a sleeveless shirt, there are only four body parts and once I hide the chest selection, it is easier to use the rectangle selection to selection most of the other sections. Just remember to deselect Only Select Visible Elements in the Active Tool menu. 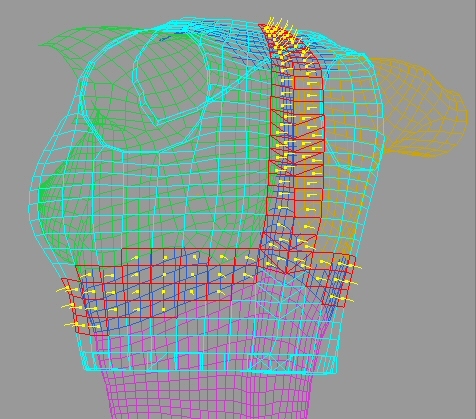 If the outfit is more complicated, keep the figure visible while selecting polygons until you feel comfortable that you don’t need it anymore. Now, before you set the next selection, make sure that you click on the smoothing tag or the coordinates tag. If you have the selection tag active when you set the next selection, you’ll replace the new selection with the one you just did. That won’t be fun since you’ll have to redo the work. Continue selecting sections and setting selections until all of your groups have been set. Make sure you hide the selections as you make them. One thing you’ll need to consider while doing selections for a skirt is whether to use the hip/thighs grouping or the hip/bodyhandle grouping. The hip/thighs grouping may give you problems with joint parameters and such while the hip/bodyhandle grouping means you’ll need to make morphs for walking, sitting, etc. The outfit shown in the second image to the right uses the hip/bodyhandle grouping method. Just don’t set the bodyhandle and hip as one selection. They need to be separate selections, with the skirt part set as “hip” and the bodyhandle as “skirt”. Now that you’ve set all your selections and they are all hidden, check your modeling window to make sure you didn’t miss any. Turn off Backface Culling to make sure you’re seeing everything. If you’ve missed any polys, you’ll need to determine which section it goes with, unhide it, select the stray poly and the selection, then reset the selection. Once you are happy that you’ve got everything correctly set, choose Selection : Unhide All from the menu. Save your file – don’t skip this! If you have C4D v7 or v8, go get the Split to Object plugin, don’t argue, just go get it. Use it to split out the body parts. I can’t help you with it since I have v6 CE though. 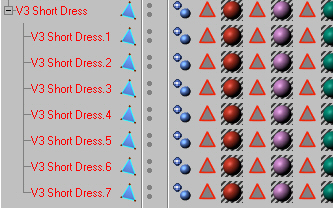 Otherwise, if the clothing item is very simple, without things like buttons or other items that you don’t want as separate piece, then use Structure : Edit Surface : Explode Segments. This will explode out each selection you made under the original figure name. Please note that this works 99% of the time but I wasn’t able to get it to work on this shirt. The image shown to the right is a dress that it did work on. The original object becomes a Null Object that holds the meshes in a group. 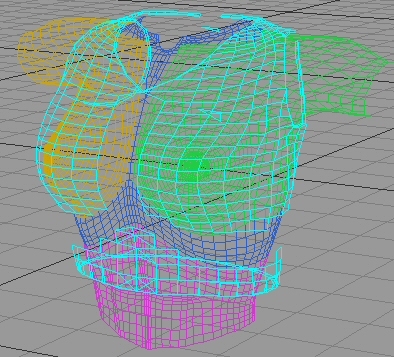 Double-click on each new mesh and rename it based on what body part it is. It helps if you are in polygon mode when you do this since each mesh will be highlighted as you click on the object name. 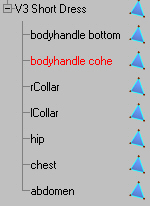 Okay, here are the parts renamed except for the bodyhandle cone and base which somehow got separated. 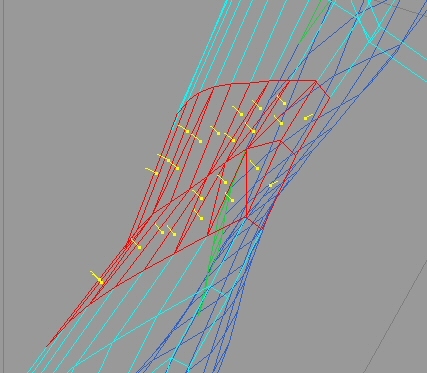 In real life, I’d Ctrl-Z to get back to the unexploded figure, reselect the bodyhandle cone and reset the selections, but for our purposes, I won’t do that. Notice that the names match the names from Poser. Skip down to the Export section below. Now, if the Explode Segments didn’t work or if you have parts that you don’t want as separate pieces (buttons, etc. ), you’ll need to split each selection out manually. First, make sure that no polygons are selected. Next, Double-click on the first selection tag to open it, then click on the Select Polygons button. 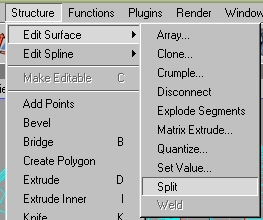 Now, choose Structure : Edit Surface : Split from the menu. 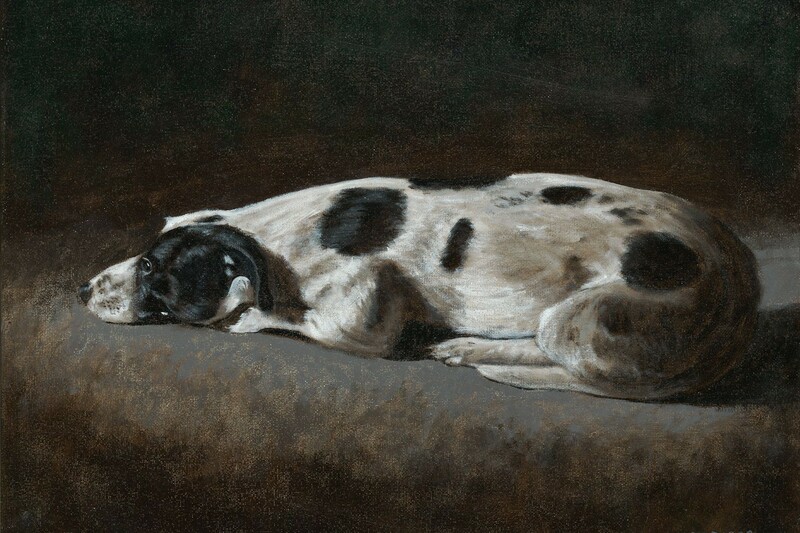 The selection will be split out from the original figure to a new object. Double-click on the new object and rename it to match the selection name. Select the original figure again, select Selection : Deselect All from the menu so that you don’t get more split out than you want. Double-click on the next selection tag, click on the Select Polygons button, choose Structure : Edit Surface : Split from the menu, and rename the new mesh. Continue until all selections have been split out and renamed. Now, assuming that you saved the file before you starting splitting, select the original figure and delete it. Also, if you have the original Poser figure still in the file, delete it as well. Now it is finally time to export this baby! You now have only your split out pieces left in the file, so choose File : Export from the menu. Give the obj a meaningful name, preferably close to what you’ll be calling it in Poser. You might also want to go ahead and save it to the Poser geometries folder just to keep things simple. Now, close the C4D file without saving it. Since you saved it prior to the split, its easy to redo all that if you need to. Copyright © 2019 Fignations of Imaginment. All Rights Reserved. The Arcade Basic Theme by bavotasan.com.